The morning (27 April) started really early. It was dark, the temperature was almost zero and most were heavily wrapped in warm winter clothes but spirits were high – Kingsday here we come! At 5 am, three buses arrived at the Radhadesh guesthouse parking. 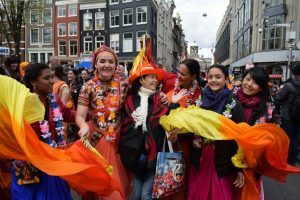 2017 marked the first year that we needed three buses to take 205 devotees to Amsterdam. This was a record number and we are not counting the large number of devotees who went directly by car and those that came straight from the UK. About an hour away from Amsterdam, our stomachs were rumbling as we made a stop for breakfast. 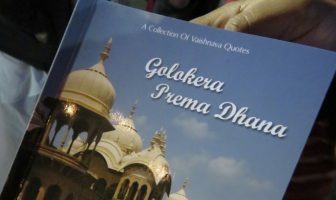 The amazing prasadam packs were prepared under the expert guidance of Nama-rupa dd. There were sandwiches with humus, fruit, a drink, sweet bars donated by Pada Pankaja and, of course, the famous sweet ‘haribols’. These food packages were a lifesaver and many devotees saved some of it for the harinama! 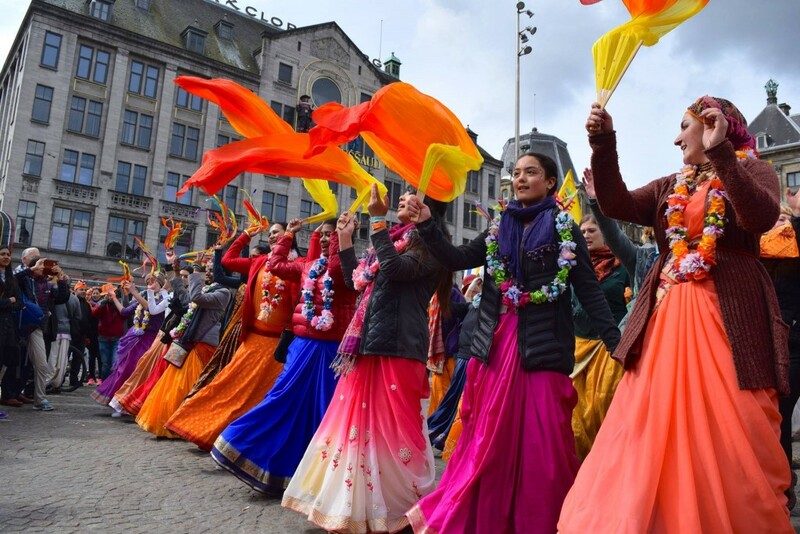 Around 9:30 am, the buses arrived in Amsterdam which would soon be turned into a dham (holy place) by the presence of approximately 350 happy devotees. A whole group of about 25 devotees also arrived from the UK headed by Parasurama. He also brought his sound machine again, complete with drum kit and bass guitar. It was going to be a fun parade! 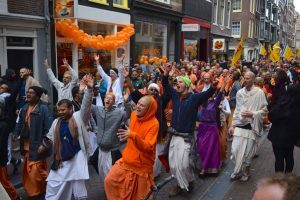 After a short break and a quick visit to the ISKCON temple, the group was about to step out for the start of the biggest and most orange harinama in Europe! 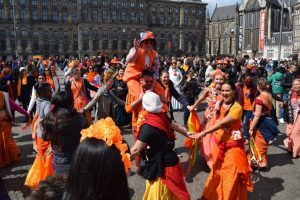 From the temple, immediately we took a straight course to the city center and Dam Square as we danced our way towards the middle of Amsterdam. 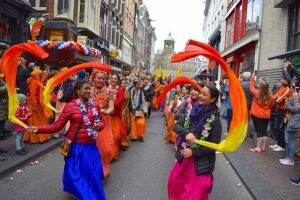 It was still quiet in those parts of town, so after spending some time on Dam Square we headed off into Damstraat. Finally, it got crowded and some people starting jumping and dancing with us. 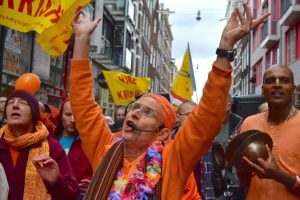 We arrived in the middle of the Red Light district and almost passed what was the first ISKCON temple in Amsterdam, established in 1973. 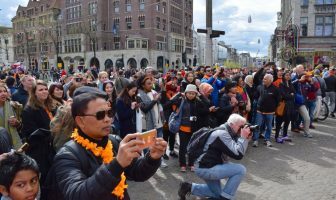 From there, our orange journey unfolded onto central station and back to the Dam Square. 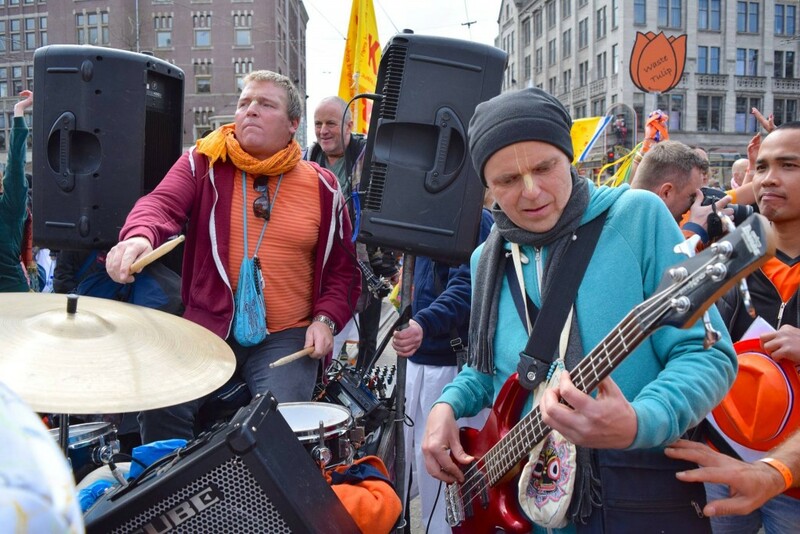 Vraja Krsna Das took over the microphone and rocked the Dam for at least an hour. He is a great singer and he inspired many to join in and to take LOTS of photos and videos! 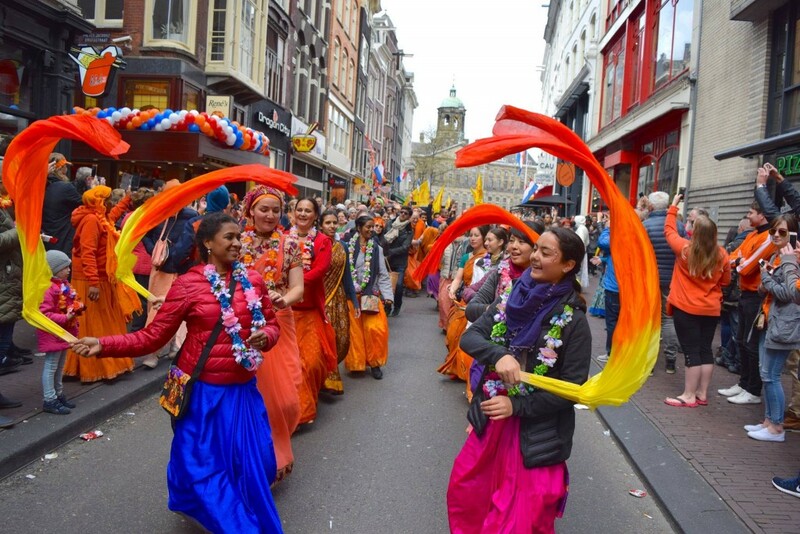 At the sound of the bells announcing 2 o’ clock, we walked on towards Rozengracht and with a loop back to Leidseplein. 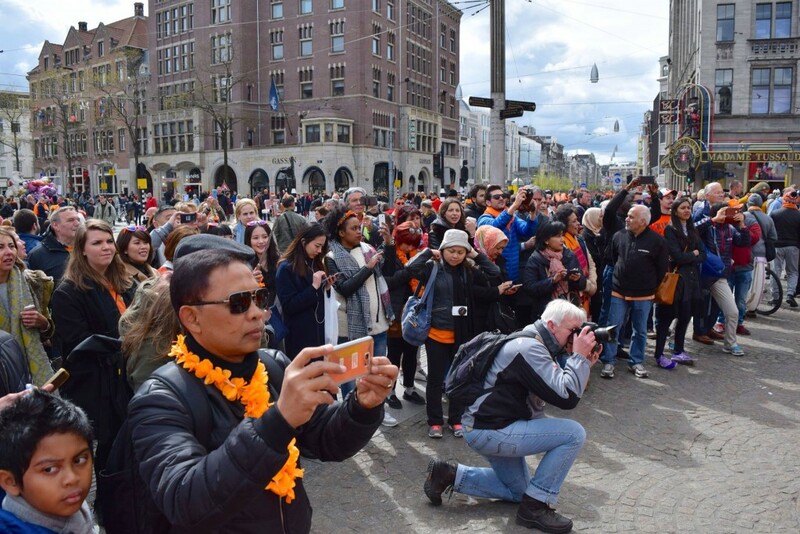 At the Leidseplein, we got the feet of many onlookers swinging about and attracted the crowds again. 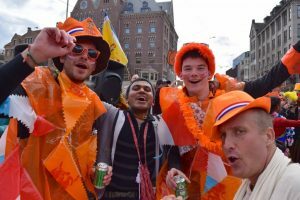 That was an easy job since we were the only big ‘event’ that was actually doing something organised in Amsterdam that day! The first part of the day came to an end at the nearby site where we stopped for lunch. Rick from Radhadesh was there again to help with the logistical part of the site and he brought a big tent, tables and chairs. 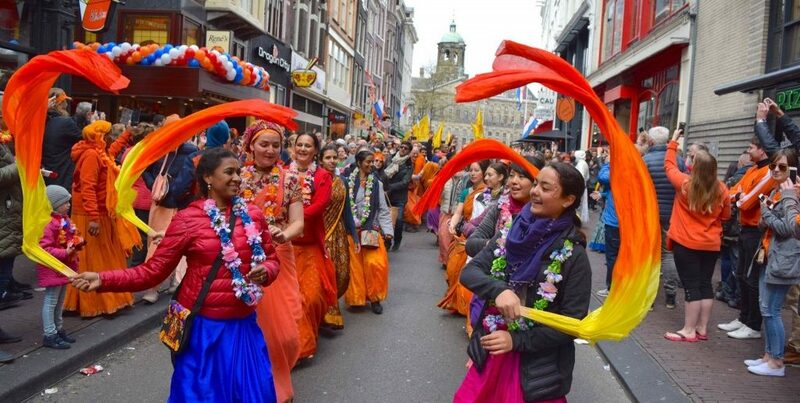 Gita Govinda and her amazing team organised the prasadam, distribution and overall planning of Kingsday. It was a BIG success and we are forever grateful for her contribution! Even though the cooking team (headed by Marcel & Kerstin) cooked for 400 people, all prasadam was finished swiftly. After the amazing lunch of pasta, halava, sweet and cake, most devotees were taking a break in the nearby park to give our feet a well-deserved rest. An idle mind is the devil’s workshop – so goes the saying – but we did not have time to sit idle as the second part of the day was about to commence. Our stomachs were filled, feet rested and the sound system geared with new batteries, once again we hit the streets of AmsterDHAMA! And we all knew what was coming… the famous ‘bridge’ in Vondelpark! Parividha Prabhu was leading the group into Vondelpark and peaked under the bridge. People came running to ‘our’ party to join in and dance like crazy. 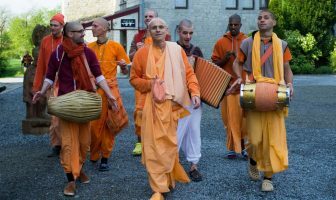 In the meantime, Kadamba Kanana Swami took the microphone and rocked on! He is famous for draining the energy of the mrdanga players but this was the first time that he drained all the energy from the batteries of the sound system!!! But that did not stop him and while using the portable sound system from the Harinam Ruci group, he continued the crescendo into a huge final craze. I thought I saw flying devotees at once stage! After the ‘bridge’, we walked, albeit slowly, through Vondelpark and headed for the buses again. We did it again – eight hours of singing and dancing. At least 350 devotees, 3 buses, 4 vans and many cars. One sound system and six (!!) car batteries. A team of 21 devotees organised the Kingsday festivities with five cooks. And, against all odds, a sunny day without any rain. Nothing can beat that!